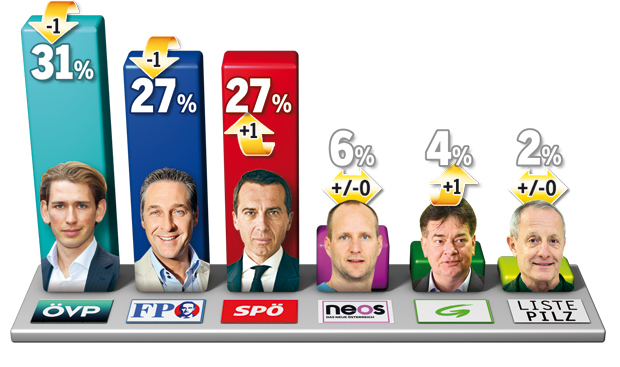 Today’s poll for Oesterreich by Research Affairs is the first national survey of the year – and shows the new OVP–FPO coalition government making a solid start. There is little movement in support among the parties, with all but the scandal-hit Pilz list still scoring within one percentage point of their 15 October election results. While both OVP and FPO fall one point, this is well within the maximum 3.2 per cent ‘margin of error’ reported by Research Affairs. That will be re-assuring to both OVP Chancellor Sebastian Kurz and FPO leader Heinz-Christian Strache: neither has been harmed by the need for compromise during two months of coalition negotiations, which proceeded remarkably smoothly (in great contrast to neighbouring Germany). Further positive news for Kurz and Strache is contained in the public’s response to the new administration. Six out of ten voters are either satisfied (40 per cent) or very satisfied (20 per cent) with how the government has started its work, while 57 per cent approve of its composition (37 per cent ‘good’, 20 per cent ‘very good’). In the ‘best Chancellor’ question measuring personal leadership, Kurz remains in front on 32 per cent, ahead of opposition Social Democrat (SPO) leader Christian Kern on 26 per cent and Strache on 24 per cent. Just like their parties, Kurz and Strache are each down a single point since the last comparable poll in late December. Fieldwork: 04.01-10.01.2018. Release date. 12.01.2018. Participants: 1020. Methodology: Online poll. Media partner: Oesterreich. More coverage here.